Nigel Twiston-Davies on Mad Moose "We told the BHA he was behaving and they believed us." Sent off the 4-7 favourite for trainer Nigel Twiston-Davies, The New One was settled in second by the handler's son Sam as Zamdy Man opened up a sizeable early lead before being reeled back in at around the halfway point. The New One travelled well but Vaniteux was matching his every stride, with the pair settling down to battle it out at the top of the hill, the market leader finding plenty for his jockey's encouragement up the hill to come home a four-and-a-half-length winner. 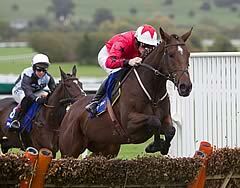 Sam Twiston-Davies said: "He's excellent. Coming into the race, we had to win it to become a Champion Hurdle contender. He wasn't flashy, but when he comes to the track he does what he needs to." The winner's stablemate Mad Moose also lined up for the Grade Two event on what was his first outing in over a year after being banned for refusing to race on numerous occasions, but the veteran once again dug his heels in at the start and took no part. The winning trainer said of The New One: "He's just been unlucky in the past (when suffering interference in last year's Champion Hurdle). He's brilliant. "We're not making any decisions (on running at Christmas), it's tight but we will see. You can't rule anything in or out in this world. Just because he's British, it doesn't mean he's not very good. "He was unlucky in the Champion Hurdle last year and apart from meeting the last wrong at Kempton he would probably have won there, too. I don't think he would have had to have improved too much, but it all went very well." Twiston-Davies admits Mad Moose's career is almost certainly over, but hopes he can enjoy life outside of racing in the future. He said: "I'm afraid I'm sure the BHA won't let him run again. It will be a red card. He's been brilliant, but he's intelligent. He's very kind and gentle and a lovely horse." Nicky Henderson said of Vaniteux: "That told us exactly what we thought. He'll be better on better ground, but we sadly found out what we expected - that the other horse was just too good. "He's still got his whole life in front of him. We decided to down the hurdling route, rather than chasing, this season, so we'll have to think what to do next."